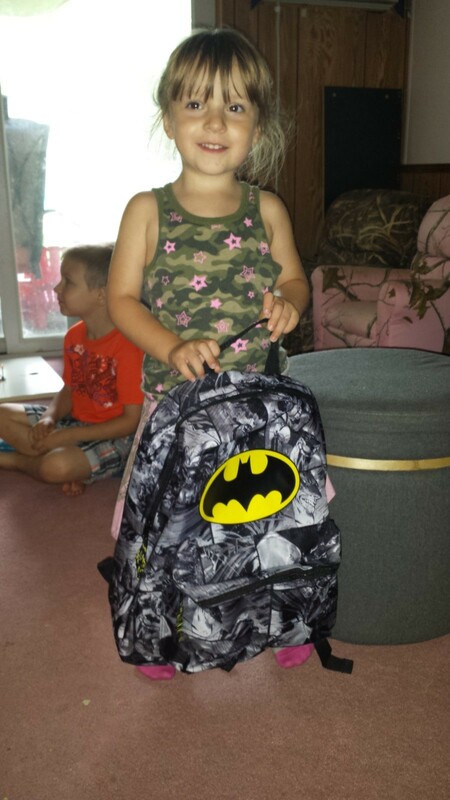 My daughter will be going into preschool this fall. In my neck of the woods, they can be in it when they’re three. Sweet. So I registered her for the three-day a week program through our school district (It’s way less than a daycare with a preschool program, or a church’s preschool program, and it’ll be kids she’ll be going to school with in the future as well, so for me, it’s beneficial.) My little girly girl – who picked out a pink paisley and cammo skirt, her pink cowboy boots, and her cammo tank top with pink stars (she looooooves pink. Maybe a little too much.) went to Walmart with me today to pick out a backpack – because I know she’s going to need one. She pointed to the Barbie bag. Me: Do you want that one? Me: *points to the Minnie Mouse bag next to it* What about this one? Me: What about the Doc McStuffins one? Her: No, Mommy. I don’t want dat one. Me: Which one do you want? Her: *points further down the line of bags to the boys’ backpacks* Go dat way, Mommy.